Skull Moth and Roses Artwork Print. Gothic art print, perfect for alternative home decor! It would also make a great gift. Featuring a skull, moth and purple roses design with a grey distressed background. Illustration by Rae Henry, originally drawn in ink and watercolour, printed onto 300gsm card and supplied in a protective clear cello bag. Choose from 5×7 inch or 8×10 inch. Although I have tried to ensure the colours in the listing are as true as possible, due to differences in monitors and screens, the actual print may vary slightly in colour/ shade. Black Rose Art Print. Alternative wall art to decorate your gothic home. It would also make a great gift. 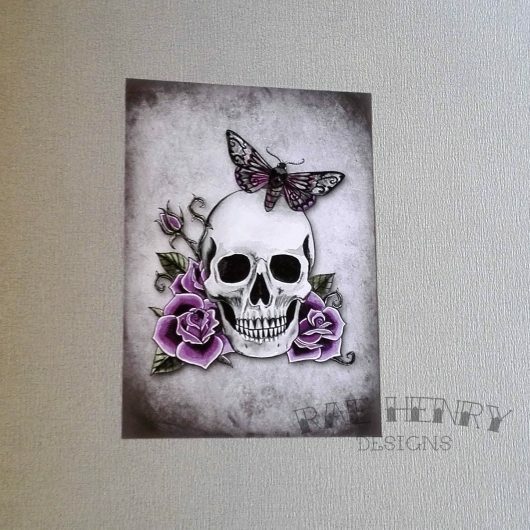 Featuring an original tattoo style black rose design with a distressed grunge sepia background. Illustration by Rae Henry, originally drawn in ink, printed onto 300gsm card and supplied in a protective clear cello bag. Bats Art Print. Alternative wall art to decorate your gothic home. It would also make a great gift. Featuring a bats silhouette design with a green distressed background, printed onto 300gsm card and supplied in a protective clear cello bag. Also available in purple. Mystical art print perfect for alternative home decor! It would also make a great gift. Featuring an original design inspired by palmistry fortune telling posters with a sepia/ brown distressed background. Illustration by Rae Henry, originally drawn in ink, printed onto 300gsm card and supplied flat, unframed, in a protective clear cello bag. A3 size prints have a white border approx 4mm. Although I try to ensure the colours in the listing are as true as possible, due to differences in monitors and screens, the actual print may vary slightly in colour/ shade. Bat Art Print. Alternative wall art to decorate your gothic home. It would also make a great gift. Featuring an original bat design with a purple distressed background. Illustration by Rae Henry, originally drawn in ink and watercolour, printed onto 300gsm card and supplied in a protective clear cello bag. Also available in grey.